The story (there is ALWAYS a story, isn’t there??) goes like this. My daughter Arlie was off on the other side of the world in China. As I would get up each morning, she was settling in for the night over there. Part of her nightly routine was to email everyone about her adventure du jour. Often, we would be passing emails back and forth at that time, checking in. I went to the Mid-Atlantic Quilt Festival down in Hampton, VA on Saturday morning, as I do each year right around my birthday. I had been reading Arlie’s messages, and generally thinking about her and her trip, while wandering around alone being awed by the fabulous art! glanced at it every once in a while. Suddenly, this brown and green and grey paisley started to take on the shape of fish. My mind started thinking about what I could do with fish. Then, Arlie came to mind. And China. And Oriental fabric. Yes, the paisley were no longer inanimate, they became KOI fish. I started searching the booths for oriental fabrics that complemented this fabric, that reinforced the koi idea. I put it to the side, in the dreary February light, and promptly forgot about it. In June, I finally decided to look at it again. Still had no idea about patterns, or what other fabrics would work. While digging through my prodigious stash, I discovered this incredibly perfect fabric with handwriting, in the EXACT odd shade of taupe I needed. The fish…they moved. The koi pond, it radiated. ever-growing collection of fabrics quickly gelled into a Drunkards Path Variation, no matter how I tried to talk myself out it. 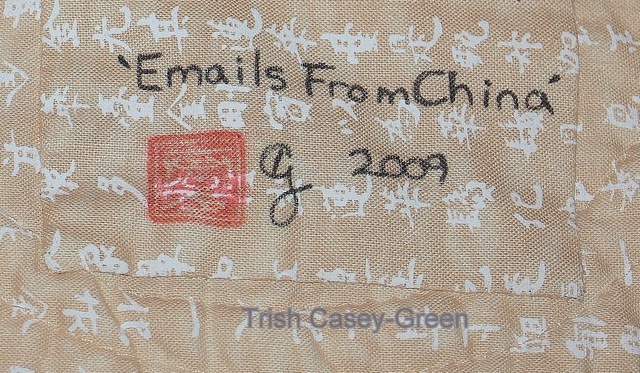 And the writing on the fabric, suddenly represented the communicating that Arlie and I did ‘virtually’ each day while she was away. The idea of the writing substituting for the typing, the circuitry of computers echoed the ripples in a fish pond, moving information and communication. from China. It says, LOVE. I used that on the label. The quilt is 40×40, and quilted with outlines of koi over the surface extending beyond the shapes on the fabric. 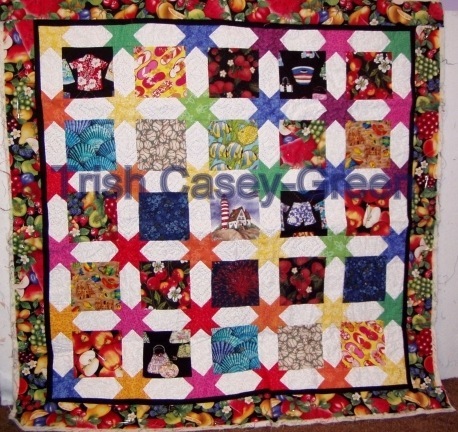 It is quilted with ENTHUSIASM but not necessarily skill, lol. But overall, I am very happy with it, am no longer afraid of curved piecing, and actually plan on making another in this same pattern, which is a first! When it arrives home, I believe it will be hung in the bedroom…. This is the most beautiful story and quilting adventure ! 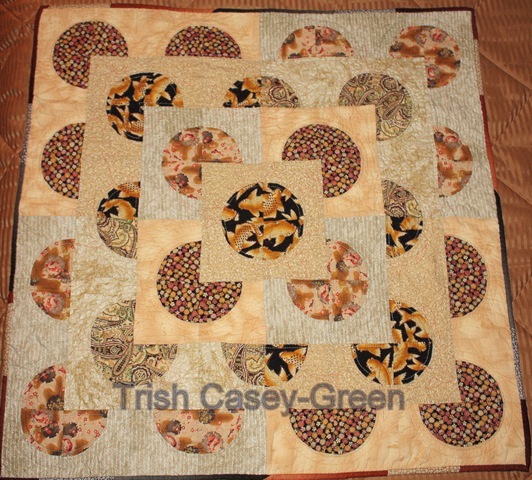 I love the way you describe it and started this creative quilt. The Drunkard’s Patch has some very interesting variations, the circle is one I never tried. Bravo and thanks for sharing. Love your quilt and the story behind it. You should be very proud. Its nice to read something that you are so passionate about. It sounds the same to me as when I write about cars. You can feel how much of yourself you pour into each of these works of art. Well done, both by inspiration and execution, and your work will always be first place with me. I love your quilt, your story . Thank you for sharing your talent and life. I have a China connection as I was there in 2000, my son return a year and a half later at 15 and now at 23 is married to my “promised” Chinese daughter. Is your daughter still in china? I would love to know more about her adventure. Great story. I love knowing how people get inspired. Thanks for sharing.